I’m so stoked to finally share the Bethesda Terrace wedding of Sarah & Eric with you! They stayed at the awesome (and awesomely located) Park Central Hotel, then migrated up to Central Park for their wedding ceremony, followed by a brunch reception a short walk away at Tavern on the Green. How do you keep it simple and classy when getting married in NYC? Follow Sarah & Eric’s lead! Get ready somewhere great. Have the ceremony somewhere cool. And go somewhere delicious for a meal with your family and friends. I spent a few minutes with Eric getting ready as he put on his jacket and made sure his pocket square was on point. As he left for the ceremony, I spent some time with Sarah getting some details of her wedding dress and her awesome Betsey Johnson lace bridal shoes. As we walked to their Bethesda Terrace wedding, we caught lots of great candid moments. Before the start of their Bethesda Terrace wedding, Sarah stayed back with her dad for a few moments together. As he walked her down the stairs and through Bethesda Terrace, you could see the joy and pride on his face. I love the hug he had with Eric as he handed her off to get married! The rest of the ceremony contained just as many great moments, especially when they exchanged vows. Tears all around! Great ceremonies like this keep me on my toes, and my head constantly looking around for moments unfolding. Such a great Bethesda Terrace wedding! I’m a huge fan of all of the hugs and congratulations that happen right after the ceremony. I stick close to the couple and get as many as I can, because they come quick! Bethesda Terrace is a great part of Central Park to start taking wedding portraits. The classic architectural elements show that you’re not just in any park, but one of the most iconic parks in the world. In fact, most of the locations you see in movies and TV shows are from this southern end of the park. Bethesda Terrace and Naumburg Bandshell in particular are two of the most recognizable locations, so why not use them for your wedding photos too? Sheep Meadow is one of my favorite spots in Central Park. Skyscrapers emerge from the dense greens of the park while a wide clearing opens in front of you. Usually it’s full of locals sunbathing and grabbing a margarita from the cooler guy. Sprinkle in the tourists that have stumbled upon this field and you have a great mix of characters to watch. As Sarah & Eric walked towards Tavern on the Green, it was still pretty empty so the views were extra nice. Tavern on the Green is a classic choice for taking people out for special meal. Brunch after your wedding? Definitely a good call. Are you considering eloping in NYC? Wondering where to start? Check out our Essential Guide to Eloping in NYC! Are you traveling to New York for your elopement? One of the hardest things to figure out might be where to stay! With so many amazing options it can soon get overwhelming to choose, so I’ve put together a short list of some of the best elopement hotels NYC has to offer. These are great hotels in their own right with amazing customer service and amenities, but they also look incredible and make for a sensible place to start telling your wedding story. I love starting with my couples before they’ve even gotten dressed (haha, not like that), spending a few moments to capture their outfits and other small details and moments. These add so much richness to the wedding story! Really great hotels also have awesome spots to use for portraits before we head out the door, allowing us to capture some more variety in your final photos without even having to travel anywhere. Located near Central Park, The Whitby Hotel is a celebration of contemporary art and design in a neighborhood that’s usually much more sterile. As soon as you walk into the lobby you’re greeted with a splash of color from all of the different art installations. This feeling of colorful luxury translates to all of their individually-styled rooms, many of which feature a private terrace with views out to the skyline. Quirky touches like a briefcase record player round out the charm, but the large industrial windows that bathed Natalie & Peter in gorgeous north-facing natural light are what got me excited. 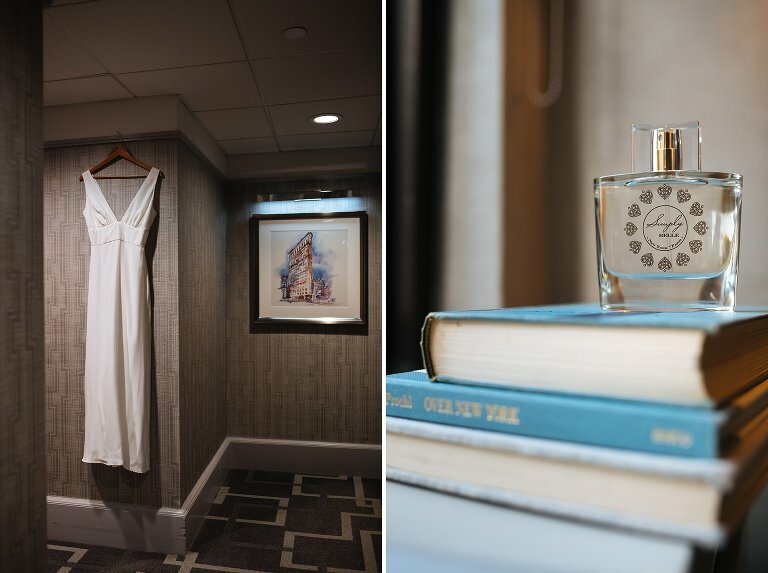 While is a fantastic hotel to get ready in before your ceremony in Central Park, it’s also a great option for venues like 620 Loft & Garden or the 3 West Club. 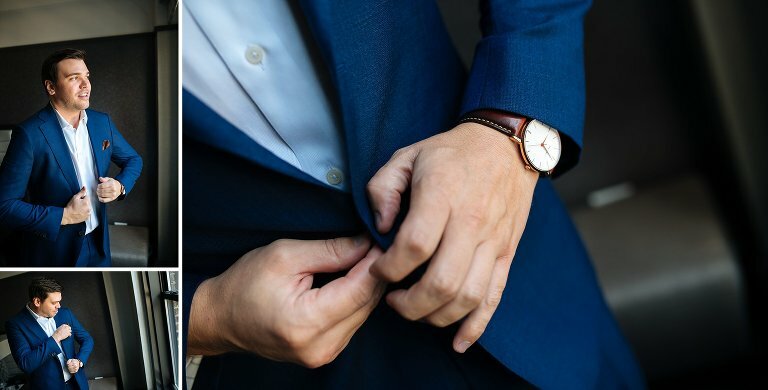 You’ll also enjoy the hotel’s central location in midtown, with easy access to numerous shows, activities, restaurants, bars, and transportation options. Bonus – The English countryside-chic lobby bar and restaurant are bathed in natural light, and they serve a traditional Afternoon Tea! Nestled on the border of NoHo and the East Village, The Bowery Hotel is a luxury boutique hotel with a seriously cozy vibe. A doorman in the hotel’s signature red vest glides the door open for you, leading into the dim wood-paneled lobby. A stone fireplace beckons from across the room. Humphrey Bogart would definitely grab a drink or two here. While the lobby is off-limits for photos (they frequently have celebrity guests), the rooms ooze with the same character and make for great getting ready photos at the start of your wedding day. Just outside the doors and within short walking distance are some of the best spots for graffiti in the city, along with great pocket parks and blocks with some of the edgier NYC look that some couples want. Before and after your wedding you’ll also love the hole-in-the-wall restaurants and quirky shops of the East Village, along with a healthy nightlife scene. Bonus – Gemma (the on-site restaurant) has a private dining space that’s perfect for a small group! Staying here is like getting a key to the city, because you literally get a key to the most exclusive park in the city — Gramercy Park. Photos there are strictly prohibited, but you’ll get to enjoy the park during your stay…which is quite a privilege on its own. Besides that little perk t enjoy on your own, we’ll also have a few moments upstairs in the stunning terrace bar for some unique portraits (as long as there isn’t an event going on). The hotel’s location is very central while being tucked away into one of the quieter corners of the Flatiron District. Nearby you’ll find plenty of upscale dining along with easy transportation options. And did I mention that key? Bonus – You can book out the terrace for your ceremony! But what if we want something more unique when we elope to NYC? While the three hotels above are some of the best elopement hotels NYC has to choose from, some of you are still searching for something different. Fear not, for I’ll be doing a roundup of some awesome AirBnB rental options and the city does not disappoint! Are you planning an NYC elopement? Click here to see more information on elopement photography and let’s chat!